The contemporary World Wide Web thrives on the appeal of aesthetics. Visually alluring websites are invariably also the ones that enjoy loyal traffic. All other things held constant, a website with better visuals will simply kill another with humble designs. No wonders, graphic designers, photographers, visual content developers, and anybody who has anything to do with designing, are bracing up to be a part of the wave. Amazingly, these artists themselves feel the need for an appealing web portal wherein they can flaunt their creations, create a one-stop portfolio to win over clients with, and of course, to retail their visual creations. Whereas there are dozens of extremely simple to use, affordable, and power packed free web builders out there. And one of them is Pixpa, a dedicated online portfolio builder for the audience we mentioned. Any photographer, designer, and artists can create a masterly online portfolio using Pixpa, within an hour, without the knowledge of any computer language. Choose from mindblowing futuristic themes, experiment with all kinds of content elements, leverage existing styles and bring your own creativity to the fore with customizations, manage image galleries, integrate a blog, and sell your content – all this and more, with Pixpa. We’re sure you’re excited about learning more on how you can quickly set a functional and impressive portfolio up. Here’s a step by step tutorial for you. How to Set a Stunning Online Portfolio Up Using Pixpa? Visit www.pixpa.com, the home page of this web portfolio builder. The breezy colors of the landing page communicate an unmistakable sense of quality; plus there’s all the info you need about the builder’s features, organized for you. Click on the GET STARTED button. You’ll be taken to the theme selection page of the builder, where dozens of awe inspiringly beautiful web templates await you. These are organized across categories like Portfolios, Personal, Business, Blogs, etc. These themes are responsive; plus you have the option of switching between themes at any time. Drag your mouse cursor over the theme you like, and click on the START WITH THIS THEME button to get things moving. Once done, you will be asked for basic sign up details. The great part – you don’t need to provide your credit card details, and can enjoy a 15 day free trial. Click on GET STARTED once done. Be prepared to be overwhelmed as you see the Pixpa console take shape. Again, the makers have adopted a light azure and teal green theme that conveys class. On the left side, you see a sidebar with few basic options. Lines horizontally on top is the core menu options bar. Observe the pop up message box to the right, where the CEO of Pixpa invites you to take a basic 3 step tutorial. We recommend that you take it. Firstly, let’s tell you about the options available in the left sidebar. Click on this button, and you’re shown all kinds of content elements to add to your portfolio. Galleries, custom pages, preset and cover page, drop downs, web links, and a lot more. There’s a help guide you can use to know more about each element. This is where you’ll spend most of your time once you’re done with the basic set up. There is a fair share of image handling options such as copy/paste, rotate, delete, etc. Use the ADD IMAGES button to add all your creations to your project. Pixpa lets you integrate your Instagram content right into your online portfolio. You can add a cover image along with banner text and parallax effect banner. Also included are SEO settings, a help guide, and a featured image option. Pixpa’s blog management features let you handle basic content, which is understandable, because you’d rather focus on the portfolio and let the blog be an accompaniment. Add and manage posts, and use tags; that’s about it. Here’s the preset page for your ‘about’ page. You can edit the content in the way you want, use filter content blocks from the right sidebar and drag anywhere to add exciting new sections to the page, or use the help guide to know the deeper settings better. This works more or less same as the About page; you get a bare bones layout that you can edit. Use all kinds of text options, and the stunning preset content boxes that can be added anywhere on the basic page. On to the top menu bar now. This is, basically, the main console page, where you access each and every option, apart from getting the root level view of your projects. If you wish to change the basic styling of your portfolio, use this option. Using the LAYOUT sub-section, you can edit the site background, specify header and footer banners, and manage how content sections overlap each other. Use the TEXT sub-section to set your portfolio portal’s navigation menu up. 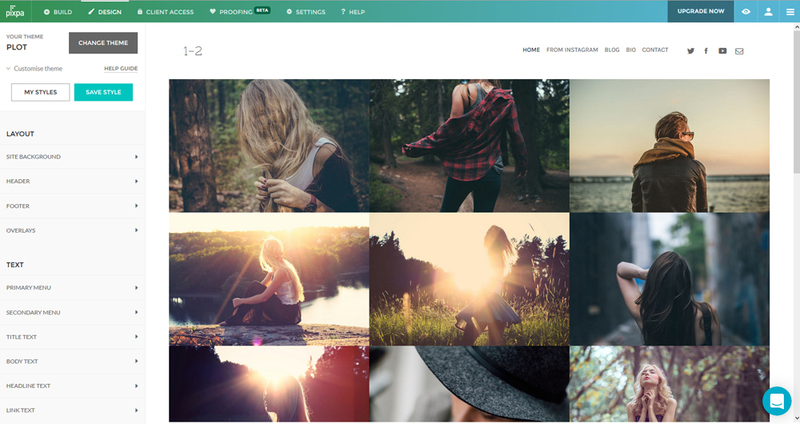 The IMAGE PROPERTIES sub-section is all about aspects such as borders, hover reactions, thumbnails, etc. At the time of this review, the PROOFING console was still in BETA testing mode. This is something you can use to add WIP content to your Pixpa suitcase. This is where Pixpa packs all its punches. The extent and sophistication of the kind of settings on offer is certainly going to blow you over. SEO Data – Define the description you want to be shown in search engine results for your portfolio. Manage individual content level SEO options. Pixpa also gives you basic SEO advice, so that your portfolio becomes relevant for the World Wide Web. Social Media Settings – These allow you to create icon based social media profile links, integral to a fully fledges online portfolio. You can also manage the positioning of these icons. Ecommerce-Fotomoto – Pixpa lets you take things a step further, allowing integration with Fotomoto, a reliable ecommerce option for photographers, designers, and visual artists. Apart from these, there are settings to control and manage Disqus commenting, Calendar, External scripting, Password protection, and Language. There you have it, a basic ride through the options and settings offered by Pixpa. This walkthrough, along with the in-built help guide from Pixpa, will make sure that you are equipped with the basic know how of creating a stunning online portfolio with this tool. Next up, we present the most notable features and benefits of this fabulous online portfolio builder. What Makes Pixpa Worth Your Time, Money, and Effort? Pixpa themes are among the differentiators of this portfolio builder. Each theme is stunning, and sure to make eyeballs dilate. Plus, these themes are spread across categories, helping you pick an appropriate one. Leveraging latest CSS and HTML technologies, these themes are future ready, responsive, mobile friendly, and of course, customizable. Make changes to the styling, and save custom styles for reuse. Integrated assets such as Google Fonts make your task easier, a variety of content elements such as forms, pages, galleries, etc help you create wholesome content, and real time publishing helps you get things moving in a jiffy. With Pixpa, you’re always in control. Crate all kinds of galleries, organize content, choose among display layouts and options, create slideshows, define image titles and captions, leverage the Lightbox Image Viewer, experiment with equally fabulous gallery styles, and do a lot more. With smart and fast image uploading, CDN empowered image delivery, captions, image SEO options, responsive image delivery, and progressive image loading, Pixpa has all boxes ticked when it comes to offering futuristic image management options. Pixpa offers you the core preset pages right from the main console, and brings to you the flexibility of creating any number of additional pages. Choose from hundreds of design elements that you can just drag and drop in your page, and then customize on the go. All pages end up fully responsive, you can add video blocks, there’s on page image editing functionality, and advanced developers can even tweak HTML and CSS codes to get their portfolio designs spot on. Embed Google maps, contacts forms, multimedia content, and get on with sophisticated page building. Forms, availability calendar, guest books, info pages – you name it, and Pixpa has it. Since graphics designers and artists can maximize their portfolio’s exposure by developing a rich blog alongside, Pixpa offers basic as well as advanced blogging features. Creating and managing posts is as easy as 1-2-3. Not only can you integrate our blog into your portfolio, but can even create more than one blogs, all integrated with the parent portfolio. Add tags for classification, embed images and videos, leverage Disqus commenting, use SEO features to enable your blog content for search engines, use preset content layouts, and leverage social media sharing options – all this and more, with Pixpa. SEO for your graphics portfolio is a tricky business – you can’t do without it, and you don’t have the skill to do it (in most cases). Pixpa solves the puzzle for you, handling the A to Z of basic SEO for your portfolio. Each content block van be enabled for better SEO, by adding keywords, meta description, and titles. Images are SEO optimized, which makes your portfolio a powerful marketing center for you. Robot.txt file and sitemap are automatically created and submitted to search engines. If you wish to take the SEO a step further, feel free and leverage the entire gamut of SEO settings to make your portfolio the favorite of all search engines. Pixpa’s paid services can be availed via any of the 3 plans – Starter, Pro, and Plus. All Pixpa plans come with core features of custom domains, drag and drop based content building, integrated blogging, Google analytics, and responsive website building. Plus, there’s 24×7 support, SEO features, Fotomoto ecommerce, and unlimited bandwidth. You see, even the free package packs a punch. The core difference between the Starter, Pro, and Plus plans is the quantity of resources on offer. The Starter plan allows 10 galleries and blogs, Pro allows 50 of both, and Plus comes with no limits. Similarly, the storage space for images and the bandwidth, vary across plans. There’s no Proofing facility in Starter, whereas the Plus comes with 25 GB cloud storage for Proofing. Pixpa generally offers discounts on annual subscriptions. Niche web portfolio builders can be tricky to manage, particularly when the users are not really keen on spending any time with the nitty-gritty of the controls. Pixpa’s makers seem to have realized this, which is why this online portfolio builder is finding favors with several creative artists across the web-sphere. The features come aplenty, but more importantly, are well organized and delivered via an intuitive and user friendly interface. To top everything up, note that Pixpa offers a no strings attached 15 day free trial. There are no intrusive advertisements, even in the free plan. The pricing is transparent and the support is prompt – it’s a winner. If you’re a photographer, designer, or merely looking for a personalized portfolio to bring all your designs together, look no further than Pixpa, because it has got all that you will need to built your portfolio, and allows you to do that without having to navigate through a steep learning curve. Also don’t forget to check our post Top 10 Best Website Builders for Creating Online Portfolio.